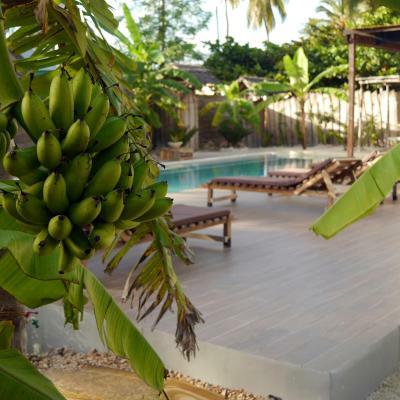 Lock in a great price for Villa Huruma – rated 9.7 by recent guests! It was very stylish. The owners spent a lot of time creating a a beautiful hotel. The breakfast was also really nice as we're the staff and owners. Great, modern hotel close to the beach. The owners are lovely and even provided a breakfast to go when I had a 7am taxi to the airport. 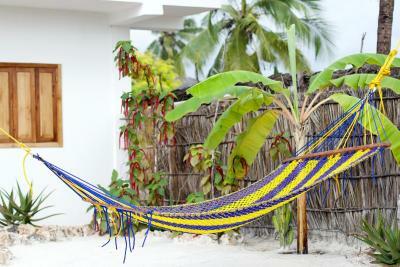 When I go back to Zanzibar I’m going to stay here again. 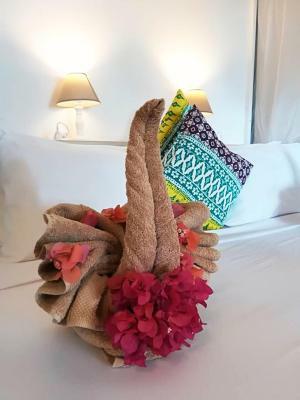 At Villa Huruma you will get great comfort, perfect hospitality, a great location, while feeling at home at the same time! Everything was clean, the rooms are beautiful and comfortable and the hosts, Paolo and Caterina, are simply genuine and amazing. The owners and staff were very nice. Food was excelebt. Villa is beautiful. We spent a nice time. Amazing stay! Loved the decoration and facilities! Perfect location near the beach and other bars/restaurant but very peaceful and quiet for a relaxing stay! Definitely would love to go back! Very cozy, especially clean, delicious food, good coffee :) Pleasant hosts and staff. The owners and staff (especially a girl whose name is Grace) was very friendly and nice. Very very clean everywhere. 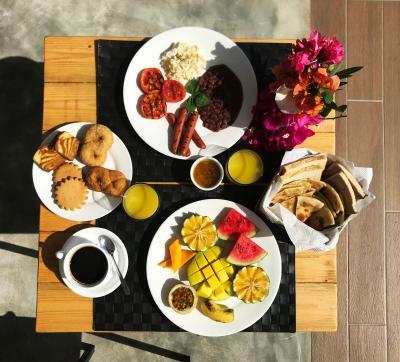 Good breakfast, very close to the beach. Big balcony. AC worked well. 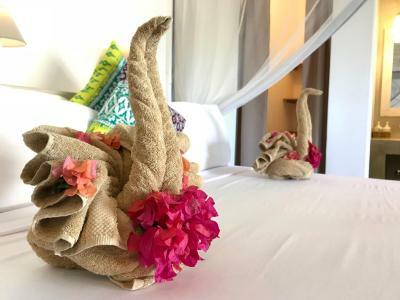 the property is very clean, the decor is beautiful and the pool is wonderful. We spent 5 days, our guests were discreet and efficient. To summarize this establishment is to recommend. One of our best sellers in Paje! 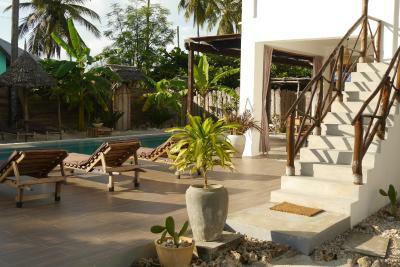 Boasting a private beach area with sunbeds and umbrellas, Villa Huruma offers accommodations in Paje. 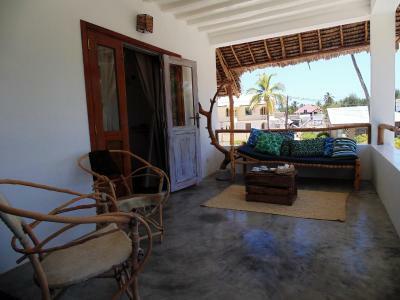 The property is located 9.3 mi from Jozani Chwaka Bay National Park and 2,650 feet from Airborne Kite & Surf Village. Free WiFi is offered. The bed and breakfast offers a continental or American breakfast. Villa Huruma offers an outdoor pool. 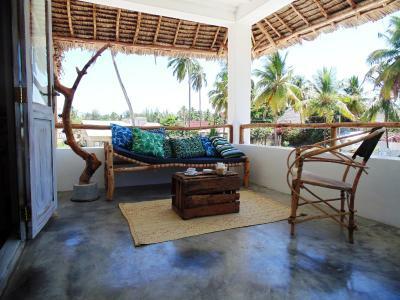 Popular points of interest near the accommodations include Paje Beach, Paje By Kite - Zanzibar and Supermarket (Paje). This property also has one of the top-rated locations in Paje! Guests are happier about it compared to other properties in the area. 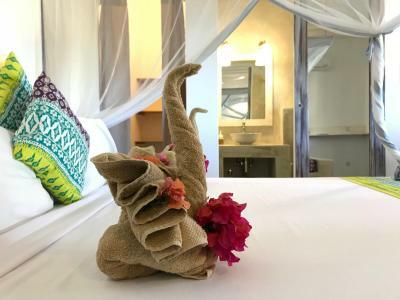 When would you like to stay at Villa Huruma? 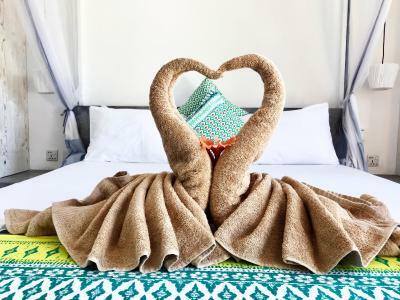 House Rules Villa Huruma takes special requests – add in the next step! The property only allows cash payments. Please inform Villa Huruma of your expected arrival time in advance. You can use the Special Requests box when booking, or contact the property directly using the contact details in your confirmation. Beds for sleeping are pretty hard. Beds at the beach miss a mattress, but they are working on this. The only small shadow on the board is the price of meals although they are qualities. Anyway this is not annoying as there are plenty of restaurants nearby. We arrived two hours before check-in and were told to sit and relax for 5 minutes, then our room was ready for us, and we could check-in way before. The food was really good; The breakfast and the dinner were excellent, specially the mashed potatos and the homemade juice were so amazing. The atmosphere was so nice and relaxing. The staff was so helpfull and friendly, Caterina and Paolo are really nice hosts, they helped us with everything and they were truly interested in the guests and their well-being. The payment was chill, we got dinner and water/soda during the day on credit and we just calculated and paid with Caterina the last day. In generel, the wifi on Zanzibar is not that good, so you can't expect a good connection during the stay. But it was nice to be off and really enjoy the stay and have a great opportunity just to relax and be yourself. We will truly recommend Villa Huruma to everyone - and we will definitely come back in the future! Thank you so much! 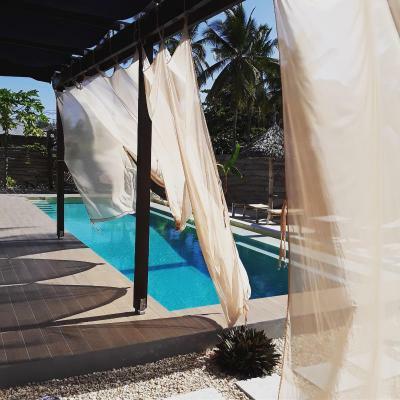 We had a wonderful stay at villa huruma! Very friendly hosts, wonderful breakfast, very clean and beautiful rooms. We had a late flight back and they were so kind to let us have a shower and we could spend the last hours at the vila after we checked out. 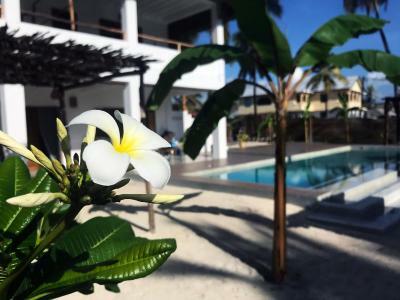 Friendly staff, close to the beach, very clean rooms, the garden and pool are very nice. I would definitely return here, it’s cozy. The bed was quite hard. Feels like staying at a friends house! The house is made with a deep love to details - so far the most beautiful accomodation we stayed in. Absolutely recommendable! 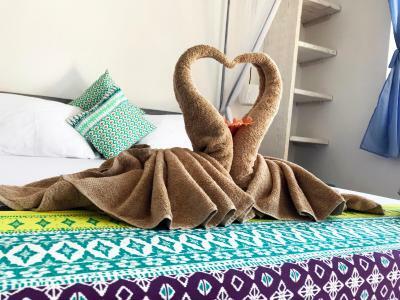 The hotel is charming, clean and cozy and the owners are friendly and helpful! Don’t forget to taste their mouthwatering dinner options! It lived up to my expectations!! 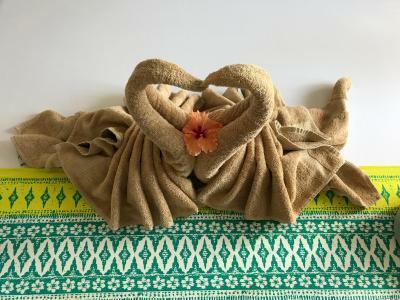 Very cosy, staff was wonderful, close to the beach, nice pool. Thanks! My only suggestion would be a few more shaded areas in the garden, just because the sun is so hot in the middle of the day. But it was never a big problem. Incredible place to stay in Paje. The owners and their staff were all very welcoming, especially Grace who we loved chatting to at breakfast. 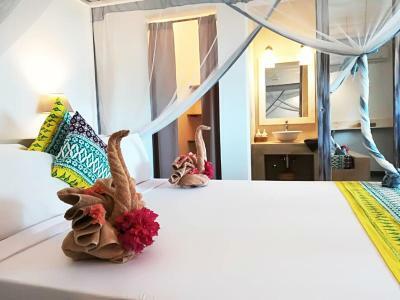 The rooms are gorgeous and really cool, despite the Zanzibar heat. You don’t even need aircon at times, very well designed. The pool and garden area is bliss, and we just loved lounging around all day, dipping in the water and relaxing. Location is great, a short walk to the beach and restaurants in Paje, but quiet and away from the bustle. Breakfast was hands down the best we have had on our 3 month trip, we are vegetarian and the choice was great, and it tasted delicious. When I go back to Paje I’ll be staying here everytime.